Webster University Thailand Campus, In the early days of the American frontier, poor children were forgotten when it came to education. The Sisters of Loretto, a Catholic religious organization founded in 1812, set out to offer a solution. The Sisters of Loretto laid the cornerstone for Webster University on Nov. 1, 1915. Originally named Loretto College, the school was one of the first Catholic women’s colleges west of the Mississippi River. It was progressive for its time, providing higher education to women when it was not generally made available. In the 1970s, few European universities offered a flexible, American-style education. Webster College sought to be one of the first. In 1978, Webster opened a campus in Geneva, Switzerland, capitalizing on the global perspective the city would add to a student’s education. 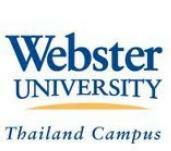 In 1999, Webster University’s Thailand Campus was open. Adding a global perspective that stretches across the Webster curriculum. As an International campus of Webster University, St. Louis, Missouri, USA, WUT embraces the Mission and Scope of the main campus. However, WUT has extended that vision to include “an accredited American University operating in Southeast Asia to create future leaders for a multicultural world”. To this end, the International Faculty have been appointed specifically for their credentials, their desire to work with international students and their experience outside academia. All courses are taught in the English language and students enjoy a student-faculty ratio of 1:15. The degree programs offered follow the requirements set by the academic departments at Webster University, St. Louis. All students within the Webster University Worldwide system have the opportunity to spend part of their degree program at one or more of the Webster’s international campuses. Alternatively, all registered, qualified students may seek a permanent transfer for degree completion to another campus within the system. This is a wonderful opportunity to grow intellectually, while proceeding to graduation without impediment.